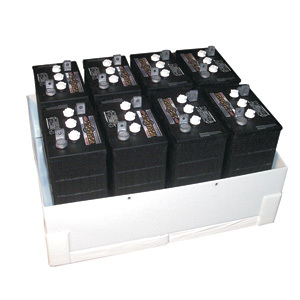 Lead-acid batteries produce hydrogen gas when charging. But if the battery box is left open to vent gas in cold climates, the batteries get too cold and battery capacity is significantly reduced. A vent that solves this problem is especially important when battery boxes are placed in basements, garages and sheds. When heat rises in the structure, a low pressure area forms around the box, cool air flows into the box and gases vent into the structure. The Power Vent controls battery box venting, removing hydrogen gas while reducing cold air infiltration into the box. 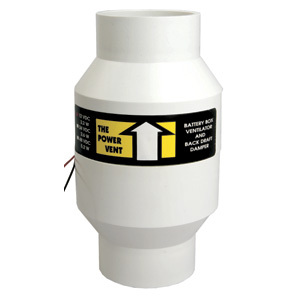 The Power Vent contains a gravity-operated damper that normally stays closed. When connected to a voltage-controlled relay, the fan operates only when the batteries are being charged and blows gas vapors out. 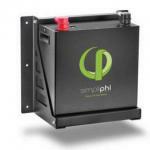 Designed for battery banks under 2200 Ah and charge rates under 125 amps. 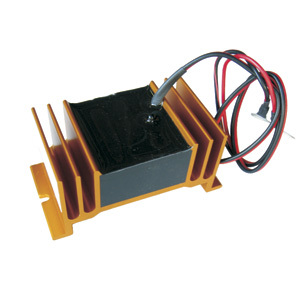 Fan can be operated from the auxiliary relay on a Xantrex XW inverter, from the auxiliary relay of an OutBack FX inverter (use 12 volt-fan for all OutBack inverter voltages) or by a voltage controlled switch (sold separately). 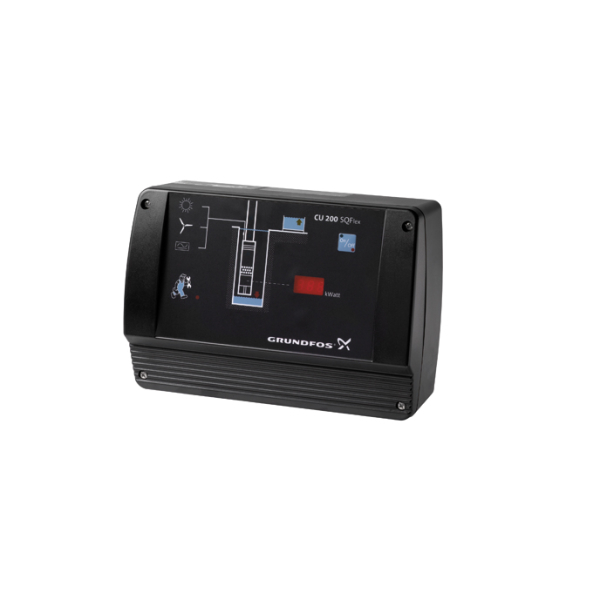 The 12/24-volt unit uses 3 watts and pushes air at 6 CFM with a 360° maximum change of direction. Dimensions: 4" diameter x 7.25" with a 2" PVC pipe socket on the inlet and outlet. 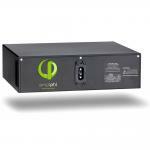 The 48-volt unit uses 6 watts and pushes 8 CFM with a 360° maximum change of direction. Dimensions: 4" diameter x 10" long, with a 3" PVC pipe socket on the inlet and outlet.